Maybe you could list the parts for a beginner, intermediate, advanced setup. Or a list of links to your favorite sites. I'd love to see different aquascaping layout techniques such as Iwagumi setup, Driftwood and plants and so on. Nice blog you have here. Good job! Perhaps you can share basic setup for beginner to start on. 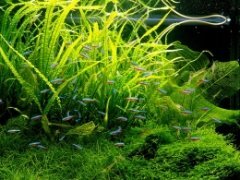 Something that even a newbie without any knowledge of aquascaping can refer, try and be proud of. Most of beginner prefer something that simple and cheap so they wont spend too much on something that they don't really need or can simply DIY at home. Very good ideas! I've been thinking about writing a step by step guide to setting up a basic planted tank on a budget, but that would entail actually setting up another tank and I've already got 3! Maybe I can do a step-by-step nano tank. We'll see, you've gotten the gears turning. Thanks! I am a Biologist and Horticulturist starting my first aquarium in 15 years. Thank you for creating these simple, complete and true articles! I appreciate your work. I'd like to know how if and how I should get CO2 into my new 5 gallon aquarium. Please I want to know how to set up plants "step by step with a picture" started from the empty aquarium, so the plants will stick to the ground and will not float. Sorry for the bad English. Does it need soil, or just sand and gravel. Thank you very much.